Unexplained Headaches or Jaw Pain in Comstock Park? At Stewart & Hull Aesthetic & General Dentistry in Comstock Park, we have been practicing quality general and cosmetic dentistry since 1974. 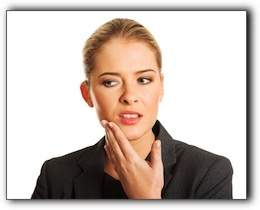 Have you noticed any unexplained jaw pain recently? Or maybe you’ve noticed that you constantly have headaches. In today’s post, we will focus on malocclusion, a possible cause for these issues. Malocclusion is the dental term for when your top and bottom teeth don’t come together as they should. The ideal bite is when the upper teeth are slightly forward of the lower teeth. You have probably heard of “overbites” and “underbites” but the two arches can be misaligned in many other ways as well. Crowded teeth can also cause a bad bite, as well as the opposite situation – teeth that are too far apart. If the misalignment is very slight, there are often no related issues. However, if the malocclusion is moderate to severe, the patient is at risk for many other health issues such as difficulty chewing and speaking, headaches, hearing problems, increased decay, jaw pain, and gum disease. The domino effect of these problems can get pretty serious. For example, chewing difficulty can trigger ulcers and gum disease increases the risk of stroke and heart disease. Consider also how these problems can impact a patient’s emotional well-being and power to perform their job. There are several effective treatments for malocclusion, but first, you need a diagnosis. If you suspect that you have a misaligned bite, we hope this post has given you some good reasons to talk to our dental team at Stewart & Hull Aesthetic & General Dentistry. Call 616-784-2377 to schedule a consultation and exam. Our practice also offers services such as TMJ treatment, tooth extraction, and dental implants.